Greece has revealed it’s been asked by the US to prolong anti-Russia sanctions. However, Athens stressed Russia is a strategic ally and the ‘sanction war’ is causing it an estimated loss of €4 billion a year. "I was asked to support the prolongation of the sanctions, particularly in connection with Crimea. I explained the Ukrainian issue was very sensitive for Greece as some 300,000 Greeks live in Mariupol and its neighborhood, and they feel safe next to the Orthodox Church, " Defense Minister Panos Kammenos is cited as saying on the Ministry of National Defense website on Wednesday. Russia is Greece's ally and a friendly country, our countries have "unbreakable ties" of common religion, and we have economic ties as well, the Minister told the Deputy US Defense Secretary Christine Wormuth during their meeting in Washington. Greece has lost more than €4 billion ($4.5 billion) as a result of the anti-Russia sanctions, he added. “Annually about 1.5 million Russian tourists visit Greece. We export agricultural products to Russia. 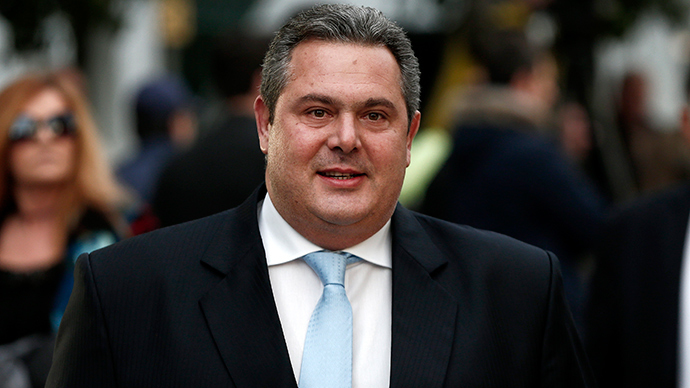 I explained that the European Union does not reimburse losses to Greek farmers on these issues,” Kammenos said. Russia and Greece have been improving economic cooperation lately; last month Moscow invited Athens to become the sixth member of the BRICS New Development Bank. Greece said it was interested in the offer. The Greek government agreed a number of strategic deals with Russia during Prime Minister Alexis Tsipras’ visit to Moscow in April, including participation in the Turkish Stream gas pipeline project that will deliver Russian gas to Europe via Greece. Russia could also reexamine its food embargo on Greece, Russia's Economic Development Minister Aleksey Ulyukayev said in April.